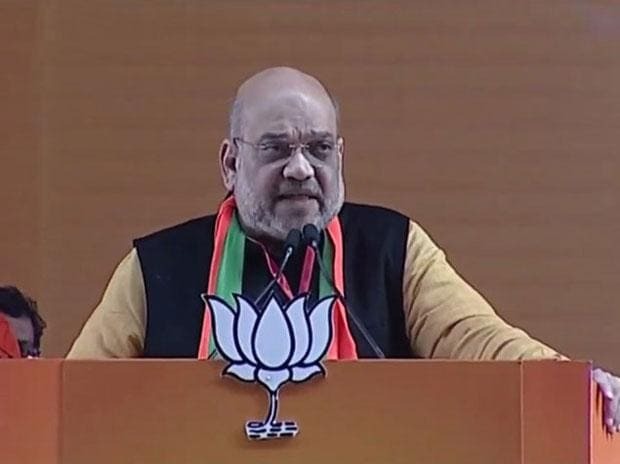 BJP president Amit Shah said Sunday that the sacrifices of the 40 CRPF personnel in Pulwama will not go in vain as there is a BJP government at the Centre now and it, unlike the erstwhile Congress dispensation, will not "compromise" on any security issue. Addressing a public rally organised by the party's youth wing BJYM here, Shah said the gruesome attack was carried out by Pakistan-based terrorists, who would not be spared at any cost. "This cowardly act was done by Pakistani terrorists. Their (jawans') sacrifices will not go in vain, because there is no Congress government at the Centre. We will not compromise on any security issue," he added. Prime Minister Narendra Modi has the strongest willpower among all world leaders to fight against terrorism, he claimed. "Already, replies through diplomatic channels, bullets and surgical strikes were given (to Pakistan). The BJP government gave all sort of replies to Pakistani terrorists," Shah said. We pay our tribute to the martyrs of the Pulwama terror attack. Forty CRPF personnel were killed and five injured on Thursday in one of the deadliest terror strikes in Jammu and Kashmir when a Jaish-e-Mohammad suicide bomber blew up an explosive-laden vehicle near their bus in Pulwama district in Jammu and Kashmir. Slamming the opposition Congress and its former ally Asom Gana Parishad (AGP), Shah said both the parties did nothing to implement the Assam Accord despite ruling most of the period since signing of the pact in 1985. "We will not allow Assam to become a second Kashmir. That is why we have brought NRC (National Register of Citizens). We will deport each and every infiltrators with the help of NRC. We are committed to that," he added. On the contentious Citizenship (Amendment) Bill, which the Centre failed to table in Rajya Sabha, the BJP president said misinformation were being spread as if it was only for Assam and other parts of the Northeast. "It was not only for Northeast, but for all refugees in entire country. The way demography is changing in Assam, without the Citizenship Bill, the people of the state will be in big danger," he added. The BJP leader claimed that only a few people protested against the bill and that too not on the issue, but only to take benefits out of the situation. "The AGP and all others, who are opposing the Citizenship Bill, were defeated in recent three council and panchayat polls. People of Assam are with peace, development, Narendra Modi, Sarbananda Sonowal and Himanta Biswa Sarma," he added. Shah also mentioned about the Centre forming a high-powered committee to implement Clause 6 of the Assam Accord for giving safeguards to Assamese people and steps taken to grant ST status to six indigenous communities of the state. The BJP president also spoke about a host of schemes initiated by the Modi government for the Northeast and urged people to vote for the saffron party again in the coming Lok Sabha polls. The Citizenship (Amendment) Bill, 2019 is set to lapse on June 3, when the term of the present Lok Sabha ends as it could not be tabled and passed in Rajya Sabha which adjourned sine die on Wednesday. Massive protests broke out across Assam and other parts of the Northeast after the prime minister had announced in Silchar on January 4 that the controversial bill would be passed as soon as possible in Parliament. The Citizenship (Amendment) Bill, which was passed by the Lok Sabha on January 8, seeks to provide Indian citizenship to Hindus, Jains, Christians, Sikhs, Buddhists and Parsis from Bangladesh, Pakistan and Afghanistan after six years of residence in India, instead of current 11 years.